Cozy Chicks: When Did Air Travel Become Torture? When Did Air Travel Become Torture? I remember the first time I rode an airplane and how great it was. Everyone got first class treatment. Nice meals, large seats, leg room--all the things we don't have now. Is it me--or did it seem to happen overnight that a 737 turned into a torture chamber? The overhead bin business is the worst part of it all. Since airlines began charging so much money to check a bag, folks are cramming everything they can into bags that fit in those small overhead bins. And if you rode on an airplane lately, there's always that one person--or often more than one person-- who HAS to know that their overstuffed bag will not fit overhead. And yet they stand in the aisle and push and shove and hold up everyone as they try to fit that square peg into a round hole. When you take a long flight like we will be taking, there are 4 tiny bathrooms at most. Two for about 200 people and two for about 20 people. There is something very wrong with that picture. It's greedy on the part of the airline and it's downright rude. And what better way to get sick than sharing air with people crammed like sardines into as many seats as they can fit onto a airplane? I had the joy of taking a flight not too long ago and the child behind me--whose mother had brought no snacks, no toys, no books for her kid, kicked my seat constantly. Flight attendants are so busy rolling a huge cart down a silly narrow aisle--so narrow only one person can really fit--they have no time to pay attention to the comfort of passengers. I love children but I do not love inattentive parents. Screaming babies I understand, but a child deliberately hurting someone over and over without being spoken to by their parent? I don't get that. The only good thing about airplanes is they can save me a 5 day trip across the country and transform 5 days into one day of travel--because if I had my way, I'd rather drive than deal with so many inconsiderate, miserable people. And even though it's a 6 hour flight, it's a MUCH longer day than that for everyone who gets on a plane. 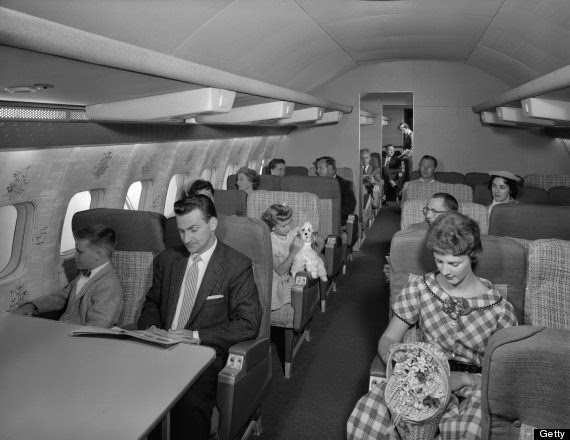 Yes, there was a day when riding a plane was comfortable and pleasant. But these days that kind of flight is only for the very rich or people who have lots and lots of miles because they have to travel all the time. The rest of us are crammed into "coach" sitting on the laps of strangers. It is a strange, strange thing. Could we have a throwback flight day? Please? Sorry to be a complainer, but I figure if I get it out of my system, I'll be one of those rare people who can smile and be polite on that long and tiring day traveling to see my wonderful family for the holidays. But they will make me forget as soon as I see their smiling faces. Happy holidays everyone! Maybe I'll see you at the airport! Big smile on my face as I can relate to what you have written - I haven't experience flying in the 70s as the first flight for me was in late 80s as a teenager.... but in recent years I've been flying a Lot. Best day to travel out of my local airport is December 24th - being a Scandinavian that's THE Christmas day for us, as we celebrate Christmas that night - seems like the stressing families with kids all travel before or after that day making he airport unusually de-stressed and the passengers that day are all just relaxed and somewhat merry. It's like when a blanket of snow comes down and put a damper on a lot of noise. Now me - I'm the one sitting reading my book(s) during the flight as I usually never have that much reading time to just read a book from cover to cover - best flying time is when the same row across the isles is just filled with bookworms as they don't get stressed during the flights. Overhead compartment - again I'm the type of person who usually is among the last people to board a plane, as why stress to get to my seat, because I know which seat I'm assigned (the ticket tells me) - funny thing is when the co-passengers and flight attendants look at my shoulderbag (actually medium-big sized handbag), when I come onboard as I am giving them a headache where to place it and they immediately try to look for space above - but my bag (with contents that can make me through a day or two if checked-in bag is delayed) fits under the seat in front of me without problems. I couple of years back I was to go to New York on a direct flight - it was delayed but the one of the male flight attendants made the most out of the waiting time - he played with the many kids in the waiting lounge, exhausting them so we hardly noticed the 20+ kids during the flight - two of the kids had been afraid of the flying prior to boarding, but they forgot it due to their new best friend who were giving them smiles and remarks when he went through the plane. Leann, this is a wonderful blog. Remember when people used to actually get dressed up to fly? As if it was "an event." Flying coach is killing. I try to accumulate as many "air miles" as I can and then pay for an upgrade to first class. Unruly kids are the worst!! I totally agree. Hi Andaje! I see you can relate! Sounds like you had an awesome flight attendant. That really helped and I just wish "getting there" didn't take so darn long! Have a wonderful holiday! My first flight was as a child in the 50's. It was a huge event, we were dressed in our Sunday best and on our best behaviour. In my recent past I worked for a federal agency which required lots of flying to areas of disaster. All the things you described are true, but what about the airports. You are dumped a zillion miles from the next gate you need. Getting your baggage involves taking a trip to another county. And there seems to be no one within the airport who can help you find the place that you need, whether it be baggage claim or rental cars. And Leann, you are right, by the time I get to the end of this torture - er flight - I am so tired I could lay down in the middle of a concourse. To show how smart we are - we all pay for the privilege. Airlines evidently are considering morphing into the people who run prisons in a foreign country which shall remain nameless - you know the one - it has a little round mean, mean man in charge. Annette you are so right on! One day I will be shocked when I discover we're taking off from the first gate after the endless security check. We have to all remove our shoes because of one failed crazy person. But healthcare for poverty-stricken children? Condemned by millions! I don't get it. I remember when you got dressed up to fly. My mom wore a hat and gloves. Now you are lucky if the guy sitting next to you is wearing real pants and not pajama bottoms or gym shorts. We lived in Malaysia for a time, which was as far from Houston you can get without getting closer. I traveled back and forth to the US with 2 little boys, and they were better behaved than most of the adults on board. But I taught them to behave and be respectful of those around them. I think the kid that kicked your seat repeatedly is probably obnoxious off the plane as well, as his mother apparently hasn't taught him how to act around people. But we have to fly, don't we? For $21,000 you can get your own bedroom, living area & personal butler for your flight across the US. The ironic thing is that they are sold out for 5 months. Definitely an economic gap somewhere. We do have to fly. I actually recall when we flew to Florida once that we were in one of those long aisles of seats. We had are elementary age kids with us. When we were getting off the woman who had been in the same row stopped me to tell me she was not happy to see she would be sitting next to two children--but they changed her mind. She said she had never seen such well-behaved and delightful kids on a plane. And now they are well-behaved and delightful adults! :-) That's why we're bigger than they are at first! You could also feed a lot of hungry people for that. Something is very wrong. Sigh. I laughed at "children run around like they've been set free on the beach." I love children, too, but my children, grandchildren, and now the parents of the my great-grandchildren know that when they are with me they will not be "those" children. My first flight was in 1977 going with my husband and small children from Philadelphia to Spain. It was a military charter and everyone referred to it as the "cattle car." Unfortunately, all flights now seem like cattle cars. It's sad that I have to have so many routines before I even board the flight: use the bathroom in the terminal so you don't incur the wrath of the flight attendants by daring to get in the way of their cart or never get to stand up because the seat belt sign is on, make sure I have everything I might use during the flight in my lap, because it's so crowded you can hardly retrieve things under your seat and don't even think about getting something out of the overhead during the flight. don't try to use the overhead for anything other than a barely-fits bag like everyone else - I put a coat up there once and another passenger tossed it into the seats to make room for their suitcase. Pleasant conversation over that - NOT. And is it only me who wishes when people buy food in the terminal to eat on the flight that it's not something with a lingering smell like fish? I live in the Bay Area and I have noticed that when returning to any of the 3 airports the second, and I mean the second, the seat belt sign is off, everyone stands up. I'm happy to be home, too, but I don't want to stand hunched over while the plane taxis and they get ready to let us off, or dodge all those suitcases that are too heavy for people as they come tumbling out of the overhead. There is always one tiny person who has a huge suitcase they can't handle and it nearly/sometimes falls on someone as they are trying to get it into the bin. And word of warning: don't think you're clever like we did and reserve the exit row seats thinking it will be almost as comfortable as they old days, all that leg room. They do warn you that the seats are "slightly" narrower. Not sure what their definition of slightly is, but the little bitty woman next to us said she felt like a sardine. I am no longer little bitty and was husband never was. I guess I am a complainer, too :-). Now that we are both retired will take car trips to avoid flights whenever feasible. Oh Leann..I so relate to this. I was just talking to some friends today about how much I hate flying. 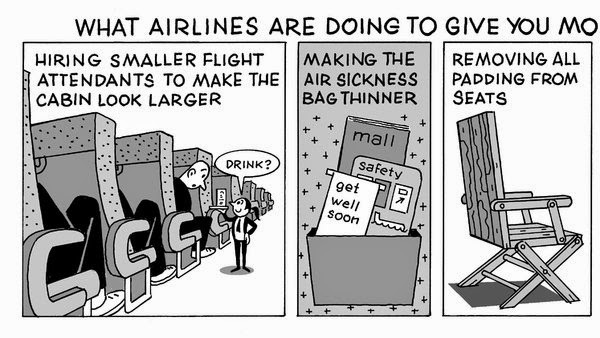 Not only the planes - which are uncomfortable and packed full of irritable people - but also the airports. Before I retired (when I still had a little money to spare) I bought into a time share in Puerto Vallarta. The resort had just opened and so it was really inexpensive. I figured I would get it then so I had a place to go when I retire. I absolutely love the place - but getting there and getting home are a major nightmare. I go every other year (it takes two years to save up the plane fare), but the last couple of trips have made me practically need tranquilizers before I go. I'm not afraid of flying - I just don't want to deal with all the hassles. It would be a 3 1/2 flight if we went straight through, but you can't do that (The last trip took over 14 hours and we basically lost a day of our trip each way. The last trip we had to go from Sacramento, California to Denver, Colorado (the opposite direction from where we're heading) and then down to Mexico. Coming home the last time was the worst. I had a small carryon with my laptop and a few things I wanted for the flight. It would have fit under my seat, but they said I would have to check it with them because there wasn't space in the overheads (which I didn't need anyway). But when we got on, about 1/2 the overheads were empty. When we landed in LAX, I had to wait for them to unload my carryon before going further. Then, go pick up our luggage, go through customs, then go through security and recheck our luggage, and then try to find the terminal we needed to catch our flight to Sacramento. It was over 1/2 a mile away. We practically ran (throough a covered street where we were sucking up gas fumes. We still almost missed our flight because the person at the "Information" counter directed is top the wrong terminal. And when you're on the plane, it is miserable. I take my Kindle and read, but you are so crammed in that you can barely move - and forget about crossing your legs. If you manage to do that, you may never get them uncrossed. I'm only 5' tall and my legs don't fit. I really feel sorry to taller people. So good luck with your trip and I'll think good thoughts for you.